The Apostolic Nunciature in Dublin is not as grand as I had thought it would be. Tucked away in the grounds of the Dominican Convent on the Navan Road, the large red brick building has two main rooms for receiving guests - a dining room and sitting room - and other than that rooms are small and functional, including a makeshift chapel which was strangely omitted from the original plans. It is here that His Excellency Archbishop Charles Brown starts his day each morning by celebrating Mass at 8am with the rest of the nunciature staff - his diplomatic assistant Msgr Juan Antonio Cruz Seranno, the nunciature secretary and the three Dominican sisters who are responsible for running the household. Apart from a few weekly jogs in the Phoenix Park, Archbishop Brown has not had a lot of downtime since his appointment as Apostolic Nuncio to Ireland. Currently he is having a well-earned holiday, spending Christmas at home with his family in the US, but before he left he took the time to show The Irish Catholic around and look back at his time in Ireland so far. A typical day at the office involves dealing with his correspondence, telephone calls and visitors in relation to his dual role as the Pope’s representative in Ireland and as dean of the diplomatic corps. Archbishop Brown’s visibility at parish events across the country has been a defining characteristic of his first year as papal nuncio. “I believe it is very important for the nuncio to be very visible and available to everybody - to parishioners, to priests and of course to bishops. But it’s very important for a nuncio to have a wide range of information coming in, and not to restrict the flow of information to the Holy See by listening to a few people, so I wanted to listen to everybody and to see for myself what is going on - especially to meet Catholics living the Catholic life in Ireland, to hear about their struggles, to hear about their joys, to hear about their hopes for the future so that I can try to help them in that - and also to support the priests." 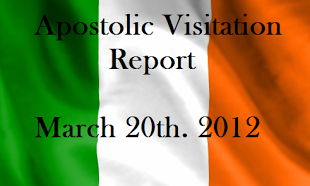 “Obviously the priests are central to any re-flourishing or reform of the Church in Ireland. The priests are a huge part of that, so I wanted to listen to them, to know them, and also make the context so that they feel they can pick up the phone and talk to me when they see things that ought to be done. It was very good for me to have that contact so that I can learn more about the situation in Ireland,” Archbishop Brown says. Next month, the Feast of the Epiphany marks the first anniversary of his consecration as an archbishop by Pope Benedict XVI before his arrival in Ireland. The 52-year-old New Yorker had previously spent 17 years in the doctrinal section of the Congregation for the Doctrine of the Faith (CDF), working with the then Cardinal Joseph Ratzinger, and his appointment as nuncio came as a huge surprise to him. Cardinal Bertone gave him 24 hours to “think and pray about it”, but Archbishop Brown said yes straight away. “Of course whatever the Holy Father wants me to do I will, that goes without saying,” he says. Archbishop Brown then had to undergo a two-month crash course to train and prepare for diplomatic work. He says he didn’t have a lot of knowledge of Ireland before his appointment, but had visited three times before, once as a child with his father, where his most vivid memory is of visiting Kilmainham Jail, and twice as a student in Oxford. Ireland plays a big part in the archbishop’s ancestry, with five of his eight great-grandparents coming from Co. Clare and Co. Leitrim. So far he has met some Irish second cousins and visited the birthplace of his great grandmother, Bridget Geagan who came from a farm neighbouring Kilmacduagh Monastery in Co. Clare. The archbishop has invited his mother to visit him in Ireland in the spring and they may use the time to track down some more relatives. In the meantime they are having a big traditional family Christmas holiday, and his mother is celebrating her 80th birthday surrounded by her six children and 22 grandchildren. Traditionally, Archbishop Brown always spends Christmas with his brother and his family in Saratoga, New York. “We have Mass in the morning on Christmas Day, after the children open their presents, and we usually have either duck or turkey,” he says. Looking back over the last year, Archbishop Brown says the experience so far has been great and he is “very optimistic about the Church in Ireland”. “If we listen to certain segments of the media all we get is an unending avalanche of negativity. But if you go out to parishes and talk to people and meet the priests and see what is happening, you get an entirely different picture. You get a picture of vitality, of great courage and great hope." “I want to encourage Catholics to be courageous in their faith, not to be afraid, not to be cowed into silence by the pressure of the scandals and negative media reports that tend to make people retreat into a very private faith. What I would like to see is for people to be joyful about their faith and not afraid to express their faith in the public square,” he says.